Stans, Nidwalden in Switzerland. Taken on the train on the way up to Stanserhorn Mountain. It's early spring but there are still lots of snow on the mountain. This is how imagined Switzerland would be. 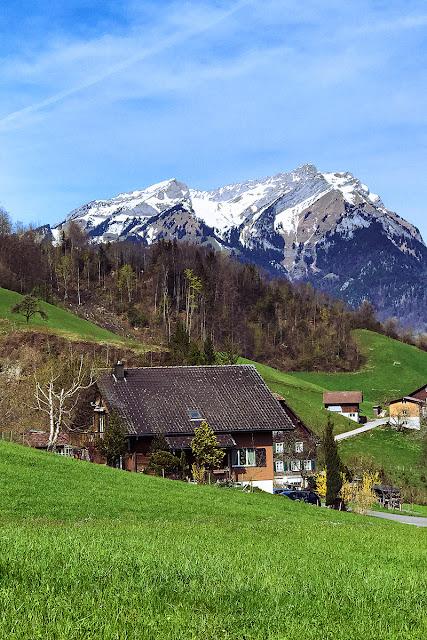 The Swiss alps, the blue sky, the corny but happy music, the endless green rolling hills, the fuzzy sound of the Alpine Horn, the experience of dipping a week old bread on the Fondue. The people in the villages are very friendly. (Contrast with the people down by the lake. ) But that seems to be across the board in most of our travels in Europe.